A Climate Realist’s (not so) short Answers to Hard Questions About Climate Change. Question 4 (of 16) What’s the optimistic scenario? – Len Bilén's blog, a blog about faith, politics and the environment. A Climate Realist’s (not so) short Answers to Hard Questions About Climate Change. Question 4 (of 16) What’s the optimistic scenario? Justin Gillis answer to Question 4. What’s the optimistic scenario? “Several things have to break our way. In the best case that scientists can imagine, several things happen: Earth turns out to be less sensitive to greenhouse gases than currently believed; plants and animals manage to adapt to the changes that have already become inevitable; human society develops much greater political will to bring emissions under control; and major technological breakthroughs occur that help society both to limit emissions and to adjust to climate change. The two human-influenced variables are not entirely independent, of course: Technological breakthroughs that make clean energy cheaper than fossil fuels would also make it easier to develop the political will for rapid action. My answer to Question 4. What’s the optimistic scenario? We are now in a sweet spot as to climate, not too warm and no ice age yet. Were it not for increasing CO2 levels the little ice age might have triggered the onset of a real ice age, but a lot of factors, such as coming out of the Maunder solar minimum, starting industrialization in England and Germany sooting up the growing glaciers so they started melting again, the diminishing effect from the Tycho Brahe and Kepler supernovas cosmic radiation, all contributed to get us out of the start of the new ice age. Yet, we are into the latter stages of the bog generating phase of the interglacial period, and the onset of a new ice age is overdue. We need more CO2, not less to keep us in the climate sweet spot. Increasing CO2 levels to between 850 and 1000 ppm should delay the onset by about 2000 to 5000 years (my guess), but after that the next ice age is coming. 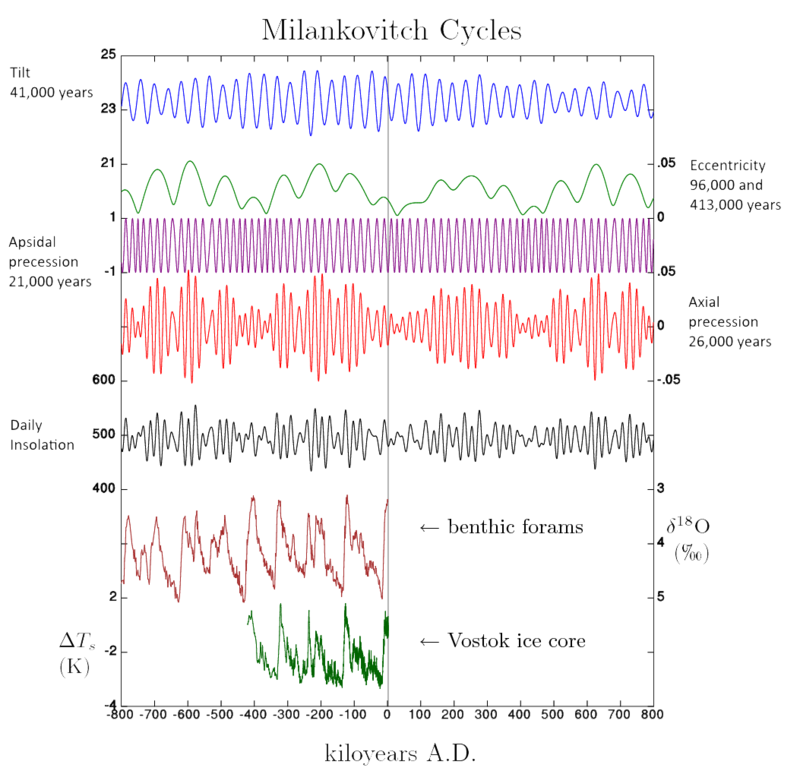 Historically, according to the Milankovitch cycles we should have already entered the next ice age. 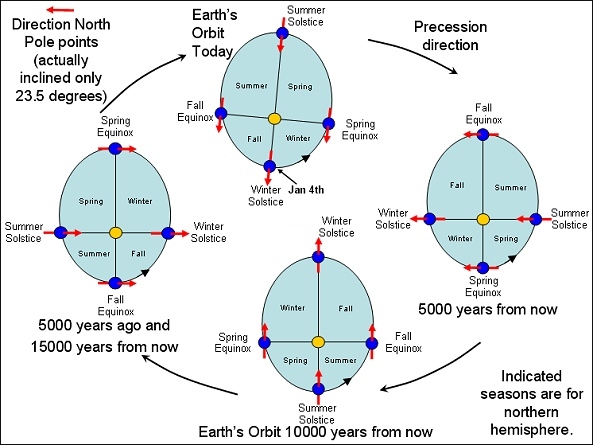 This picture is simplified, but together with the other cycles the picture is quite complicated. The take home from this picture is that daily insolation (at the 60th latitude) can vary by as much as 100 w/m2 or about 50 times the effect of a doubling of the CO2 level. It is also worth noting that the normal state of the earth is ice age, and thermal runaways have never occurred, even when in past geological ages, CO2 levels were over 10000 ppm. Answers to Question 5. Will reducing meat in my diet help the climate?Answers to Question 6. What’s the worst-case scenario? Previous Previous post: A Climate Realist’s (not so) short Answers to Hard Questions About Climate Change. Question 3 (of 16) Is there anything I can do? Next Next post: A Climate Realist’s (not so) short Answers to Hard Questions About Climate Change. Question 5 (of 16) Will reducing meat in my diet help the climate?